With ScreenCapture, you can capture details of your 360° image as a JPEG image to be downloaded and shared. Open your HoloBuilder project in the web editor. 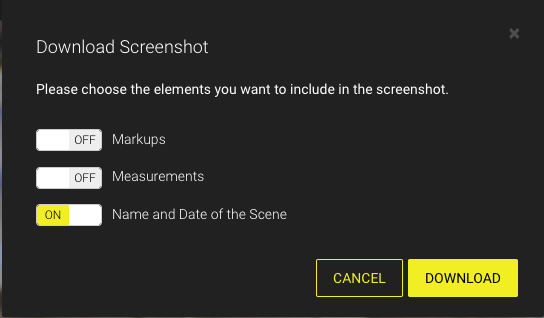 Select the scene you want to take a screen capture in. Open the 'Scene' menu in the sidebar on the right. Rotate the 360° view to face the direction you would like to capture. Click on the 'DOWNLOAD SCREENSHOT' button towards the bottom of the sidebar. A dialog will open to present you with additional options to customize your screenshot. Select which element you want to be visible in the screenshot and then click on the 'DOWNLOAD' button. The screenshot will be downloaded directly to your device as standard JPG image file. You can find the file in your download folder. If you have any additional questions or encounter any problems, please use the integrated chat or let us know at support@holobuilder.com. We are happy to help.